Are you Interested in pursuing a career in the publishing industry? Then here’s a look at the lives of Sophia M. Caraballo and Yaisha Cordero, two alumni from our department who have made it into the industry through their hard work, persistence, and dedication. 1. Tell us about your educational background and what you’re currently doing. Educational wise, I have a degree in English Lit from UPRM and I also have a master’s degree in magazine, newspaper and online journalism from the S.I. Newhouse School of Public Communications at Syracuse University. Currently, I’m working as an editorial associate for three magazines: Parents, Parents Latina, and Family Fun. Within a month, I’ll be moving over to Rachel Ray magazine with the same job position. After graduating with an English BA from Colegio, I moved to Boston, MA to pursue graduate studies in Publishing and Writing at Emerson College. I graduated earlier this year after spending two years immersing myself in everything book, magazine, and digital publishing. Luckily, I was hired at my dream publisher, Beacon Press, immediately after graduating. 2. Tell us about your job. What’s it like? My job, right now, consists of supporting the editors and writers with research and pitches for their articles. I also am in charge of writing up newsletters that are sent to our readers every week and writing up a section within Family Fun magazine, where parents learn to integrate their children in the kitchen. My job is different every day and what I really love about it is that I get to learn every single day while writing my articles about a variety of different topics, but mainly about health. I am the Sales and Marketing assistant at Beacon Press, a non-profit publisher affiliated with the Unitarian Universalist Association.Beacon publishes books focusing on progressive socio-economic values, such as: social and racial justice, environmental issues, feminist issues, LGBTQ+ issues, religious pluralism, etc. On the sales-front, I am responsible for facilitate the sale of our titles both to consumers and in bulk, coordinate author event book sales, logistical support between our distributor and our buyers in-house and outside, and oversee consumer-facing website operations. On the marketing-front, I am directly in charge of creating and handling reader-buzz campaigns in Goodreads and LibraryThing, among other places. I also device full marketing campaign for various titles, including social media campaigns, TI copy, organizational outreach, etc. 3. How did you manage to obtain your current position in the industry? Were there any challenges? Persistence got me my job. The magazine industry is known to be very competitive and from the hundreds of applications you can send out, you might hear back from 5 and three of those will be rejections. Networking is so important and I’m a strong believer that if a job is right for you, you will get it. I came across my current job from a editorial listing. For those interested in journalism and digital work, Ed2010 is the place to go. I started applying to full-time positions two months before graduation in May. I knew that the process would be long and that I wouldn’t be lucky enough to get a job on the first try, because the job market simply doesn’t work that way. I devised a very strategic and organized process of application to various positions in and close to Boston, where I wanted to stay. Most folks who want to enter the book publishing industry, set their sight on New York, because it is the mecca with the Big 5 publishers (Simon & Schuster, Hachette Book Group, HarperCollins, Macmillan, and Penguin Random House), but being at Emerson opened my eyes to the many opportunities that small and midsize publishing companies outside of NYC can bring, especially for recently-graduated folks like myself. I would frequent job-posting websites for the industry like Bookbuilders of Boston, Bookjobs.com, and subscribed to industry newsletters like Publishers Lunch and Shelf Awareness looking for entry-level positions I thought I would be a great fit, and even those I thought were a longshot. My dad always says, that you apply to everything, because you never know who’s reading your application and what they are looking for outside of experience level. I would also attend numerous networking events in both Boston and NYC where I met lovely people in the industry who have helped me learn and grow as a professional. The job search proved to be easier with a master’s degree and a couple internship experiences under my belt than previously when I applied to jobs and internships in the States from Puerto Rico. I do think that we are in a limited position due to the distance and lack of local opportunities. 4. 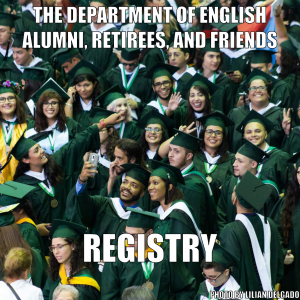 How did your time with the English Department help prepare you for this type of career? My time with the English Department was actually the one thing that told me journalism was the right career path for me. I always enjoyed writing, especially about other people and interesting subjects that readers could either learn from or identify with. And that’s exactly what journalism is to me. You have to love books to get into this industry. There is no way around it. My time as an English major prepared me well for the enormous amount of reading I have to do for my full-time job at Beacon and my side gig as a reviewer at The Horn Book, a major kidlit publication. At all times, I have three to four books/manuscripts in my backpack. The program was instrumental in developing deeper and more sophisticated reading comprehension skills and writing critically about a piece; they are extremely helpful when devising marketing copy. I will say, I’ve had to use math far more than I anticipated when I was an English major. Lol! 5. What are your current aspirations? My aspirations right now are to keep developing my skills in the workforce. It’s one thing to learn and to ask questions in college, but it’s a whole other thing to learn while working. Hopefully in the future I can go back to college and get a doctorate’s. I want to continue growing in an industry that I love with a fiery passion. I love books and want to keep getting them into people’s hands. Another very personal goal is to do my piece in opening doors for more folks of marginalized communities in publishing—be it as writers, editors, marketers, publicists, producers, artists, and agents. 6. What are the most important things one should consider or know before heading down this career path? One of the most important things to consider while being a journalist is that you shouldn’t be in it for the money, but rather because you enjoy learning and teaching others through your writing. You’re in it because you want to show the world the different issues that people have to deal with. You’re in it because it thrills you to get out there and write about someone or something anyone barely knows about. I’d say, that mentorship and networking are key. It is harder for us in PR to do this, but that’s why publishing programs like the one at Emerson, or the ones at Pace, NYU, and Columbia are excellent ways to get started. Of course, applying is the first thing. I mentioned that I didn’t have many opportunities to intern or network in PR, and it’s true. But I regret not creating my own paths back home. If you want to work with books and writers, create a Booktube channel, a review blog, a bookstagram account, a student magazine/paper, your own mini publisher, work at a bookstore, or something related. There is value in any and all of these opportunities and they will surely open doors. Editor’s note: for students interested in exploring this career path, the English Department offers a variety of courses in professional writing, media, communications, and a Minor in Writing and Communication.